I recently had the pleasure of a mid-day lunch with a friend. You are probably thinking Soho or West Village?? No -Midtown! The home of the lunch packed deli with overpriced chopped salads. Where the infamous tourist hotel restaurants with zombie-like waiters push a $24 eggs Benedict and free mimosa’s watered down with cheap champagne-but wait …. things a looking up- we now have Lexington Brass! The outpost of Abe and Arthurs fame. A sprawling campus of luxury, beautiful people and educated servers that know the food which is damn good ! According to the NY Magazine, “Lexington Brass will not blow your mind” , but I beg to differ! We started with a generous portion of crab stuffed fried oysters-, crispy, plump, and delicious. We then added the Lobster Mac and cheese which was a creamy symphony of cheese and elbows, chunks of lobster studded through a mound of goodness and topped with a crispy crust- good enough for Kid Rock, good enough for me! As you gaze around the plush bistro , you see a setting of tan leather banquettes with glass, modern fittings A great setting to gorge on delightful Tuna tacos with guacamole and chili aioli as well as hearty French Onion soup with a sherry broth and a perfectly executed Caesar salad. I could have pushed away from the table and called it a day-but wait- I cannot forgot the real reason that I came here … the burger!! Had I saved enough room to sink my teeth into this meaty monolith of goodness?? Of course I had ! Sure enough, the burger arrived with a golden brown basket of parmesan truffle fries and I was happy. The burger was served on a gigantic brioche bun with a patty blanketed in melting cheese and topped with crispy fried onions, Bibb lettuce and tomato. The burger was pretty much, dare I say, Awesome! Excellent ingredients and obviously cooked by a grill cook that has cooked a few ,no doubt! Lexington Brass does good food right- It is well worth a try ! 67 Burger Brooklyn-A Night of Opera and Burgers. On a recent trip to the Opera, in Brooklyn no less-and yes- the DMANBURGER has culture ! I was forced to put aside my aspirations of an elevated meal prior to a saturated artistic evening. Having not made a reservation first, was a big mistake because we never knew this oasis of over- crowed restaurants in Ft. Greene existed. As an alternative, I was hoping to get into the likes of the Smoke Joint, and maybe chow down on a plate of ribs and multiple side of collard greens , cornbread and baked beans, perhaps a succulent steak frites from Cafe Lafayette. But much to my disappointment I was shunned away because of “no tables for the rest of the night”-lucky them. After a long trek in the rain, restaurant after restaurant but to no avail would my taste buds be satisfied. I wasn’t in the mood for a burger, especially before the Opera, I felt I should have something more. Drenched and annoyed , I succumbed to 67 Burger, with negativity that my snarky palate could not be satisfied ….I was wrong….! The burger was pretty damn good! My first impression of 67 Burger was a well organized chaos. Attractive, young hipsters behind the counter dealing with the craziness with poise which made me feel happy and comforting. The menu here is simple- a list of juicy burgers either from the signature creations or an ala carte version-pick your toppings and choice of either beef, turkey, grilled chicken or the dreaded and a pointless veggie burger- why bother? Here at this bustling little community of burger fanatics are all sorts, families with screaming kids, a skateboarder clearly happy, an awkward first date and a lonesome guy on a rainy night, clearly cheered up by his first bite into simple burger pleasure. The aforementioned gleeful staff greets you and simultaneously brands you with a steel staff with a number so after a short wait, I hear “number 14” then you are sitting. My choice was the signature 67 burger ($9.25), a large 7oz. patty dripping with fat and meaty juices and dollop with creamy blue cheese and crispy slabs of smoked bacon, placed beneath. The 67 burger was a party in the mouth, the funky goodness of the cheese and the crispy pork love, that is bacon, all complemented by a solid pairing of a fluffy muffin tin baked sesame bun, fresh tomatoes, thin sliced red onions, whole leaf lettuce and thick crinkle cut garlic pickles.67 burger is not without creation; get the Oaxaca burger ($10.00) a plump burger with the fresh avocado slices, homemade chipotle mayo, Cajun spices, and cheddar cheese. The gamut of burger choices don’t stop there! There’s a Greek, Italian and Parisian version of the humble sandwich, a little overkill- but admirable. Let’s talk the obvious burger accompaniment-the fries. Here they are done well, fried sticks of potatoes that crunch in the mouth with a hint of salt and a soft center. The curly fry, previously created by that sub-par fast food joint Arby’s are done with perfection and showered with a helping of Cajun seasoning.67 Burger delivers a quality burger with superior service and a smile, although it comes with a price. Burger prices are definitely on the high side at this neighborhood burger shack. 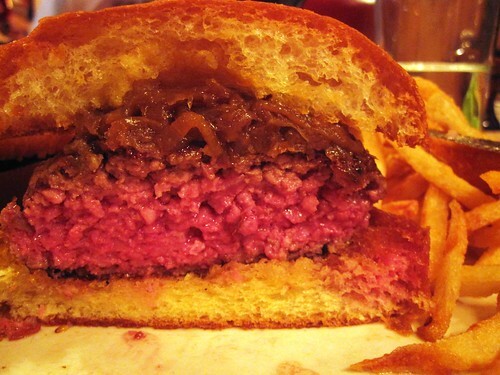 The everyday burger budget (with a couple of beers) is compromised. Put it this way, my opera ticket for “La Traviata” at the BAM was cheaper than my burger bill.But the juiciness, peppery flavor that you will receive is forgiving. Guests drifted around tasting burgers from 3 different meat vendors, Whole Foods, Pat La Frieda and Burger Maker with the “World’s Longest Topping Bar” to dress their creations with an infinite array of condiments and toppings. Anat Baron former executive of Mike’s Hard Lemonade screened her film to 600 burger eating guests- “Beer Wars”, which is a David and Goliath story reporting on the infighting of Americas Beer industry. Baron, with an allergy to alcohol, has never tasted beer, but after speaking with all the brewers, who specifically matched the flavors of the beers selected for the event, she says “Burgers and Beer are all American and apparently- the flavors go well together”. One of those beer flavors included at the event, was from star of the Beers Wars film Rhonda Kallman, who plays herself in the film. Kallman otherwise known as “Queen of Beer” and founder and CEO of New Century Brewing Company, offered up two of her new brews, soon to hit Manhattan bars-the light and crisp Edison and Moonshot, a pilsner with 69 mgs of caffeine added. A “Queen” of a different kind, was honored in the film “Florent-Queen of the Meat Market“, which is the rise and fall story of West Village iconic diner Florent, and it’s charismatic beloved owner Florent Morellet. Florent auteur, David Sigal, last night accepted the “Made in New York Award” as well as the “Feature Film award”. Sigal received his award ironically from Mayor Mike Bloomberg who was in attendance, “I was honored to get the award from Mayor Bloomberg since I love New York City, this little diner in New York’s meatpacking district had so many stories to tell” says Sigal. An avid burger lover himself, Mayor Bloomberg sauntered around the event, politely cutting in line for toppings, while gorging on burgers and chatting with people. “So far I’ve had 2 beers and the reason I’m talking funny is because my mouth’s full of my second hamburger, if that’s not a testimony of the fact I like the event I don’t know what is” says Mayor Bloomberg. Motz recalls “I sent the Mayor my book Hamburger America and he wrote me a letter back saying, I love hotdogs but hamburgers are a close second”. Next stop for the NYC Food Film Festival is Chicago, where Motz will franchise his festival for the First Annual Chicago Film Festival Sep 24-25. 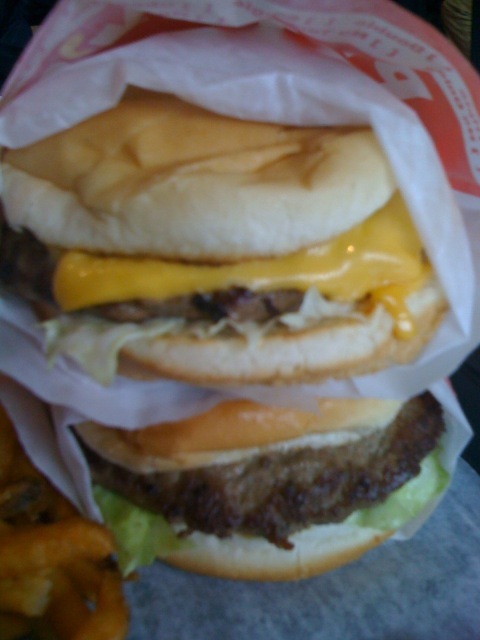 As for the mayors favorite burger in the city…..he’s a JG Melon man. George Motz burger impresario and filmmaker of award-winning film Hamburger America teams up with Food Bank NYC, the James Beard Foundation and former Schnack Dog and Water Taxi Beach Chef Harry Hawk-to bring us cavalcade of documentaries, features and short films highlighting the globes favorite foods. The Fourth Annual New City Food Film Festival is the arena where food and film blend together to make a delicious meal of sight and taste. Awards will be given out for excellence in categories such as, Best Feature, Best Short, Best Super-Short, Best Film Made in New York, Food Filmmaker of the Year and the Audience Choice Award. The festival is already underway (started June 23-27) and I have the privilege of a special assignment involving pigs ears and of course, burgers. First on the menu will be Edible Adventure #001 Smokes, Ears and Ice Cream– which takes place Friday June 25th at Water Taxi Beach. The night will showcase films from various film-foodies (full list here) and offer up some delectable film nosh like: Pig’s Ear sandwiches from Big Apple Inn, Jackson Mississippi; Smoke Meats from Fatty Cue; and Ice Cream from Max and Mina’s. A number of liquid pleasures are also in the cast of stars-featured, are Cucumber Soda from Dry Soda Co. And potables from Mixologist, Allen Katz. Sunday June 25th the NYC Food Festival comes to a close with an abbreviated screening of George Motz’s Hamburger America and Anat Barons “Beer Wars” followed by the coveted awards ceremony, which is hosted by NBC’s Cat Greenleaf. The whole evening titled, “All-You-Can-Eat Brooklyn Burger N’ Beer Garden” at the Tobacco Warehouse under the Brooklyn Bridge, promises to be a glitzy burger-poolaza with burgers from Pat La Frieda and Whole Foods and growlers of beer to be guzzled from Craft Beers. ………..and the award goes to? DMANBURGER “5 and Diamond”-new $5.00 menu from Chef David Santos. Newly knighted Executive chef David Santos, now in power of 5 and Diamond Restaurant, introduces a new 5 item all $5.00 teaser menu starting on June 22nd -Tues-Fri,5.30pm-7:00pm- for those after work- pre-dinner-“need a fix patrons” .Santos took over the reins this past week from then consultant, Ryan Skeen. The much gossiped about shift came after a confusing faux-pas by a noted New York foodie publication,”They then issued a retraction” says the relaxed Santos. On the 5 item teaser menu, Santos introduces a welcome toast with his signature White Sangria. It recently won rave reviews at a private New York food event. Also available is an eclectic menu to accompany your cocktail where Santos highlights juicy Lamb Belly Sliders, crispy light pillows of fried Cod fritters with a tangy smoked paprika aioli and other original delights not to be missed!